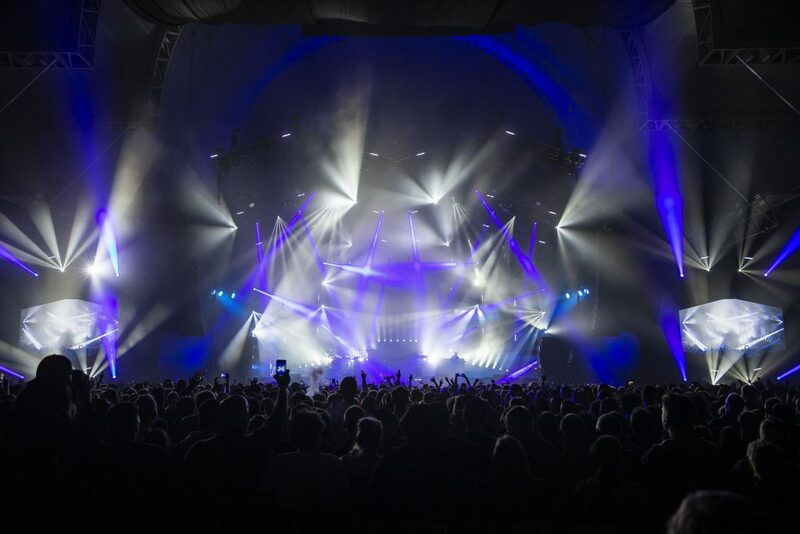 This Autumn there were a number of acts on tour in the UK using Kinesys automation, from Rick Astley to The Chemical Brothers. The last one we caught up with was dance favourites The Prodigy on their "No Tourists" tour. “I wanted a bit of additional craziness going on behind the band” stated Prodigy lighting and set designer Tim Fawkes … which is why he is utilising 8 x Kinesys Elevation motors to move four special 4-metre long lighting trusses up and down, just upstage of the band, for the current European leg of their “No Tourists” tour. The new album blasted its way to the top of the charts as the arena tour kicked off in the UK, and Prodigy wowed their ecstatic warriors and fighters with the usual array of visual and sonic anarchy that’s made them one of the most exciting live bands of the last three decades! Every bit as energy fuelled now as in the 1990s! The four pods in their home position made up two apex shapes to blend in with the rest of the structural trussing design. Each one is lined with four Martin Sceptron LED battens, five GLP JDC1 strobes, four Robe MegaPointe moving lights, four Showtec Sunstrips and five old-skool PAR cans with CP60 bulbs … for a classic ‘ACL’ look. All lighting and rigging equipment is being supplied by Blackburn based rental company HSL. Having these pods automated on the Kinesys motors using a Vector controller enabled Tim to add lots of extra dynamics to the mayhem.